Water, flour, salt, mixed with lots and lots of passion. These ingredients all form the basis of our creations, as well as the history of Scarlinpizza. The story of a family business that all began thirty years ago in a small outlet in the south of Salento, when Nicola Scarlino began to produce his speciality, initially with the sole aim of bringing pleasure to the people around him. The careful choice of ingredients, the quest for genuine flavours and a profound respect for the oldest traditional recipes guaranteed that his products were distinguishable for both their authenticity and aroma right from the outset. Within a few years, and given the excellent results in the area, Nicola had the drive and ambition to broaden his horizons beyond a merely local context and to bring his specialities to a wider range of customers. The challenge was to maintain the original quality of his products, and the way to achieve this was by taking advantage of freezer technology. 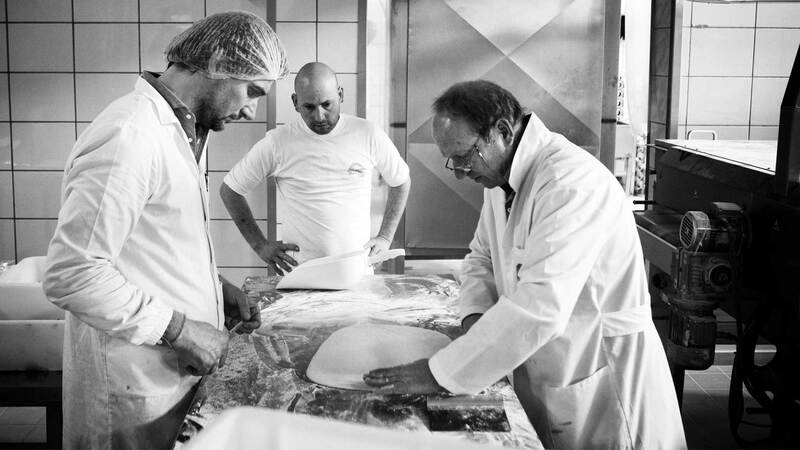 Since 1998, when the company moved into its current premises, Scarlinpizza has undergone a rapid and continuous process of evolution. Over the years we have placed great importance in investing in technology, with the purchase of new and modern equipment that has allowed us to widen our product range. Moreover, Scarlinpizza has also invested in human resources, contributing to the development of the local area and now has a workforce of over thirty employees.